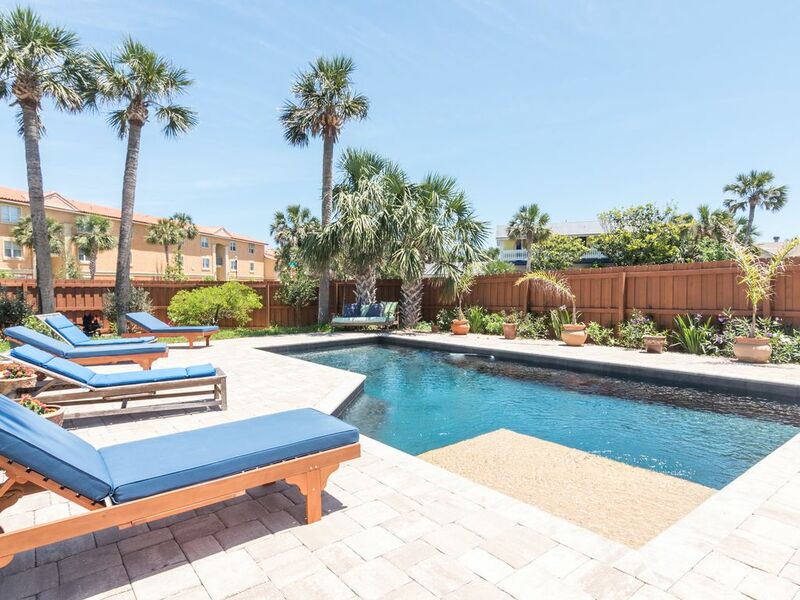 ***Please note this property is not available for parties of any kind*** Just two blocks from the ocean in Jax Beach's best neighborhood, The Oasis has the best of both worlds. After the beach, enjoy a refreshing dip in the pool. Rinse off in the enclosed hot/cold outdoor shower and air dry poolside in a lounger or in the hammock. During the colder months, put the fire pit to use (wood provided) or bundle up inside and relax on the comfy couches in the living room. Enjoy dinner with family and friends at the over-sized dining table that seats eight, or relax on the cozy sofas watching the game on the 59" big screen TV. If you prefer some quiet time, settle back in the reading area to enjoy your favorite book. This is a great place to get away and enjoy the sun and the pristine beaches Jacksonville has to offer. Because you won't find a better option in the greater Jacksonville area! Laundry key is hanging inside right as you open the front door. Go around back of the house and you’ll see a door with a window on it and that’s the laundry room. Street parking is allowed on 25th S St and on Madrid St. There is one spot in the dirt driveway on Madrid St, but please don't park on the grass. You can also park on the 25th S St gravel driveway. The pool is used by you and the downstairs tenant only. However the downstairs tenant travels a lot, is rarely home and tries to stay invisible when a guest is staying. We enjoyed our stay at The Oasis. The apt. was very cozy and felt like a home away from home. The reason I didn't give it a 5 star was the fact that the lighting was dark and we weren't able to adjust the air conditioner. Other than that we had a very nice family getaway. Beautifully decorated place located within walking distance of the beach. Pool doesn't have a heater which was a bummer as it was still a bit cold although the kids still jumped in! It truly felt like a home away from home!! It truly felt like a home away from home. The house was beautifully decorated and was very cozy!! It also had everything we needed and more!! The kitchen and dining room were great as we cooked in a few times! And the living room was spacious for us to hangout in as well! Also, the pool area was great and the beach was only a couple blocks from the house. We had no issues at all during our stay but prior to our stay the owner, William, was very responsive through email. I'd definitely stay here again and recommend anyone who plans to visit Jax Beach to as well. Thank you William for letting us stay and for your wonderful hospitality! This rental was amazing. The beach, gas station, and grocery store were all within a few blocks. The neighborhood was quiet and friendly. It’s a great place to relax by the pool. We didn’t realize it was an upper apartment when we first booked our stay, but there was more than enough room for us. We would love to come back! Beauty place, we enjoy with the pool table. Two blocks from the beach. Nice neightborhood. Good location. Great property and location. Will be staying here again. This is a great property. The owner is very helpful and works to accommodate any needs. For a house that is near but not on the beach you cant find a better location. Close to tons of great dining and shopping and a super easy 1-2min walk straight on flat pavement to the beach. Super Comfy dual living areas which is nice if you have kids and want to let them hang in one while your in another etc. Look forward to staying here again in the future. Some basic rules: 1. Have fun and enjoy The Oasis 2. No pets allowed 3. Absolutely no glassware or glass of any kind outside 4. Be respectful of the property and the neighbors. Maximum of 6 guests without prior approval. No parties of any kind. No smoking anywhere on the property, inside or out. Thank you!